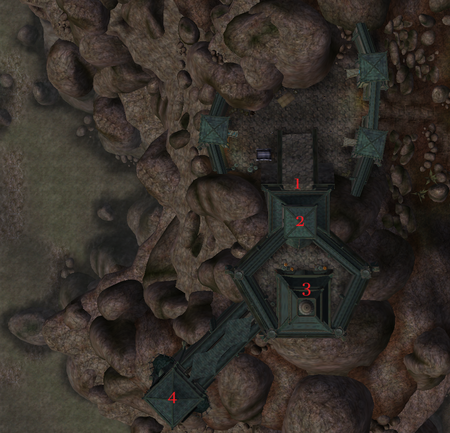 Ammar is an Indoril coastal fortress, and the northernmost Indoril-owned settlement before the start of Telvanni-owned lands. It is likely the first Indoril settlement travelers heading south will come to, and is therefore a common rest stop where supplies and equipment repairs can be had. The garrison there is well known for keeping the surrounding area of the Mephalan Vales safe and peaceful. Ammar is directly opposite the Shrine of Azura on the Vvardenfell coast. The leader of the fort is the Indoril noble Tavrene Indalas, who can be found in Indalas Manor at the top of the fortress. Services can be found in the Entrance Hall, consisting of Tavura Mervu for the Alchemist service, Methrendes Garil the Smith, and Marilie the Trader. Across a small covered walkway from Indalas Manor can be found the Guard Tower, which contains a small prison where Hlorgir Firm-Hand is imprisoned and asks for your assistance with a case of mistaken identity. There are no fast-travel services except for intervention, which takes you to Akamora(Almsivi) or Cephorad Keep/Tel Muthada(Divine) Boat travel can be found at Darnim to the south and Marog to the north, The nearest silt strider and mage guild guide services can be found at Helnim. Ammar was originally called Ayemar. The Daedric ruin of Oethadapilu can be found south of the fort across the river, along with the Dwemer ruin of Bazhthum. 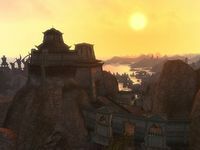 Heading north from the fort will take you to a huge Indoril-style bridge marking the boundary between Indoril and Telvanni territory, along with the Indalas Ancestral Tomb, the resting place for the deceased of the local noble family. An Inconvenient Scapegoat: A local Nord needs help proving his innocence.